Tile and grout cleaning companies will all claim to be one thing: the best. However, only one can truly hold that title. At Corpus Christi Carpet Cleaning Pros, we’re sure that WE carry that distinction! Living up to high personal and professional expectations isn’t the easiest thing. It’s much simpler to do so-so work and give average customer service than it is to pursue 100% customer satisfaction and provide the highest level of customer service each and every time. That’s why we feel confident when we claim to be the best! Just because it isn’t in our name, some people are surprised to learn that Corpus Christi Carpet Cleaning Pros does tile and grout cleaning, too. But when you think about it, it isn’t a far stretch for the same company that gets your carpet looking good as new again to also take care of the floors in your bathroom, utility room and kitchen! Our equipment is specially designed to make grout and tile cleaning extremely easy. No more scrubbing with a toothbrush on your hands and knees! Rather than breaking your back, let Corpus Christi Carpet Cleaning Pros handle the hard work! You can keep things fresh and clean on a daily basis, but when it’s time for a deep clean, call in a professional team like ours! There are many myths about tile and grout cleaning. One piece of misinformation that is widely accepted is that individuals can clean their tile and grout just as well as a professional company can. Despite your best efforts, you won’t be able to reach the deepest pores of your grout and even the much smaller pores of ceramic tiles. This is a valid question in anyone’s mind. It would seem that if you are mopping your kitchen or bathroom floors every day, or at least 2 to 4 times a week, then why would you need for them to be professionally cleaned, right? We understand the logic, and we wish it were that simple! The fact is, though, that mopping only cleans the surface of the tile and grout. Any germs and dirt that are on the surface will be removed when you mop, but it’s impossible to catch every little particle before they work their way into the deep pores of grout and tile. 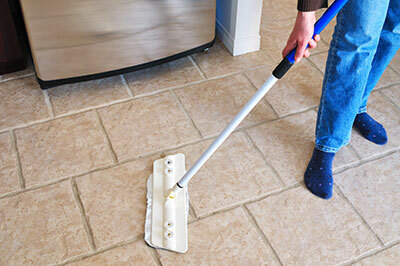 Another surprising fact for many people is that improper mopping techniques – using dirty water, scrubbing hard with an overused mop, or not sweeping before you mop – can actually make the tile and grout dirtier because it forces unwanted particles farther down where they can’t be reached without professional equipment. Don’t waste your time mopping your Portland, TX tile floors every day, when the only thing that will get them truly clean is a professional cleaning by Corpus Christi Carpet Cleaning Pros!